Croydon Vision is looking for a new Treasurer to join the Board of Trustees. The role of this Trustee will be to assist the Board of Trustees and Director with the financial management of the charity, offering oversight and guidance as the organisation continues its efforts to diversify income streams. You will lead on the financial strategy for the charity as well as creation of the annual accounts. This role does not require support with everyday finance activity. Extensive experience, and proven success, in financial management. An enthusiasm for the work of Croydon Vision and a willingness to act as an advocate. A commitment to promote opportunities for people with sight loss or community development at large. A commitment to carry out the duties of a Board Membership. A preparedness to offer personal and business skills and experience to support the work of Staff and Volunteers when required. Reviewing Croydon Vision’s financial performance, ensuring effective controls in place at all times, delegating responsibilities to the Director. Reviewing policies for finance and investment and advising the board accordingly. Responsible for facilitating the preparation of the annual accounts. Ensuring budgets, forecasts and cash flows are prepared on a timely basis. Presenting quarterly management accounts to the board. To present the independently examined accounts at the Annual General Meeting (AGM). Up to six board meetings (2hrs each) held a year (excluding the AGM), currently held at Croydon Vision’s office, and to offer time to support staff and initiatives within Croydon Vision as required. A commitment to attend some events by Croydon Vision and any other key meetings, where appropriate. 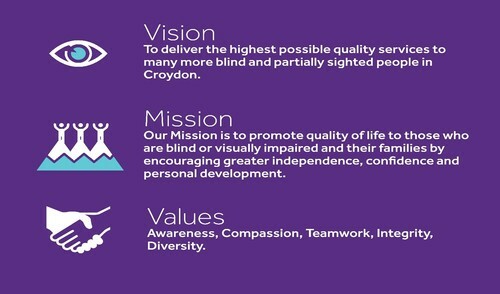 To apply, please email HR@croydonvision.org.uk your CV along with a page covering letter stating why you wish to join the organisation, how your skills would add value to the board and any other relevant information.